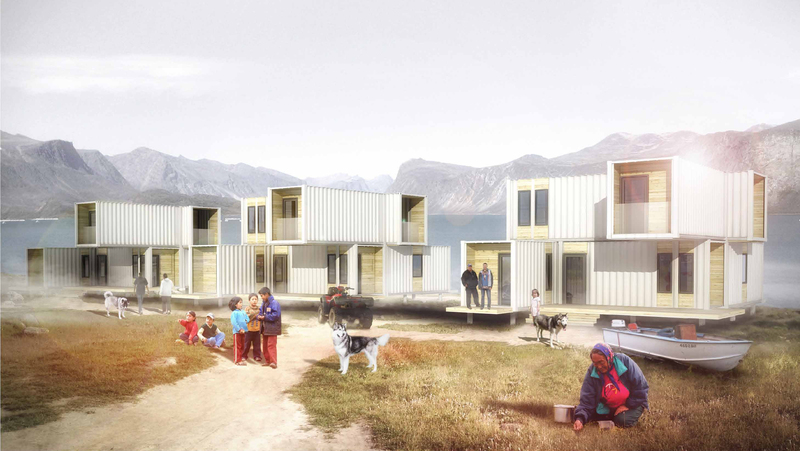 This project is a conceptual study of a community housing project in Pangnirtung, Nunavut, made with steel containers used in ocean shipping. 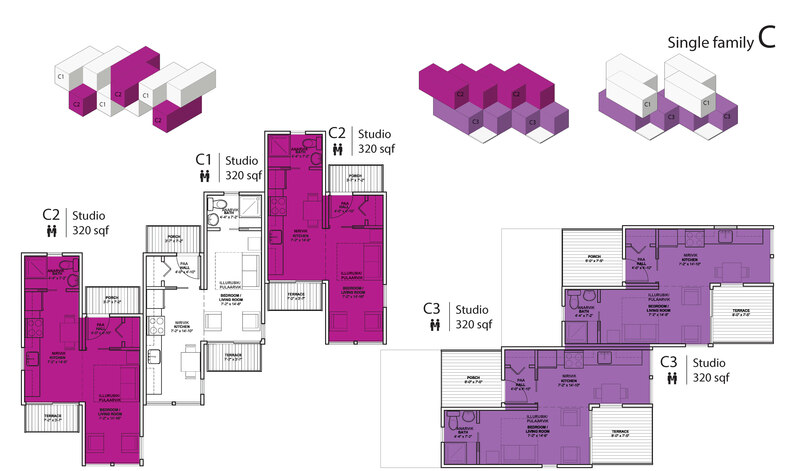 The options include single family units and multi-family units, as well as small units (studios) for singles and young couples. 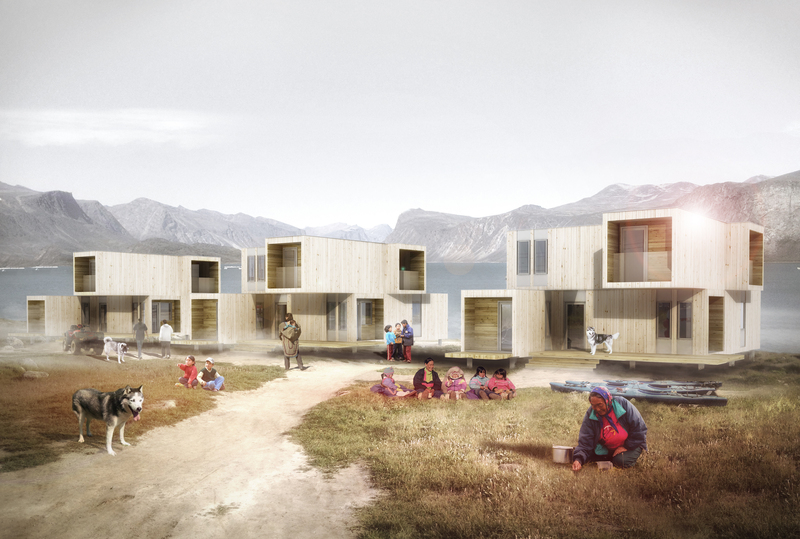 The interior designs respond to the needs of families and young couples in terms of housing and quality living spaces, following discussions with Inuits of the community in summer 2012. 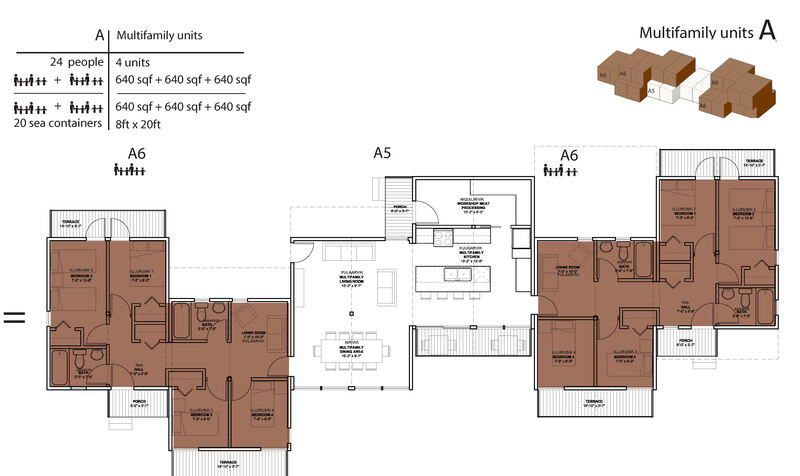 The document layout is duplex horizontally, which can illustrate on the left page, the dwelling units individually and on the right page, the possible assembly of different dwelling units. 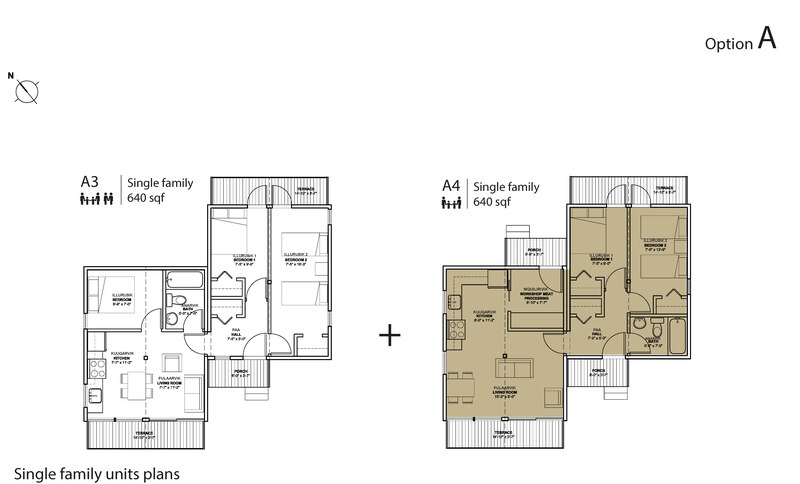 The colors on the plans are associated with dwelling units and are for information only. 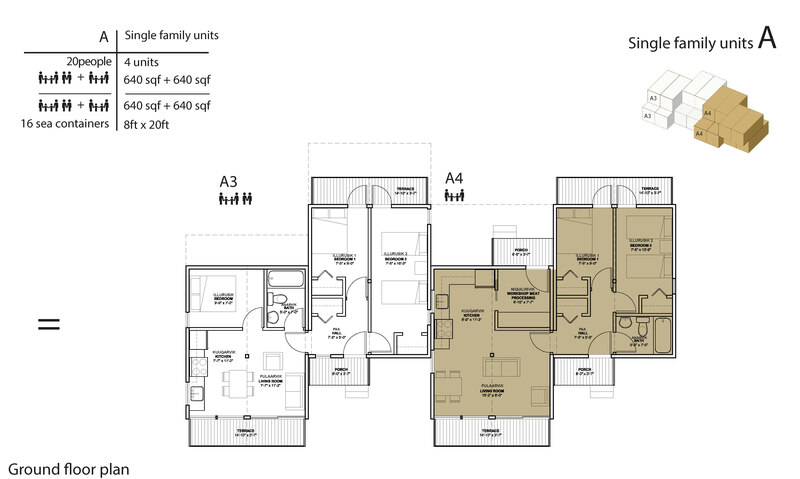 They are used to better understand the layouts and define the various types of housing units. 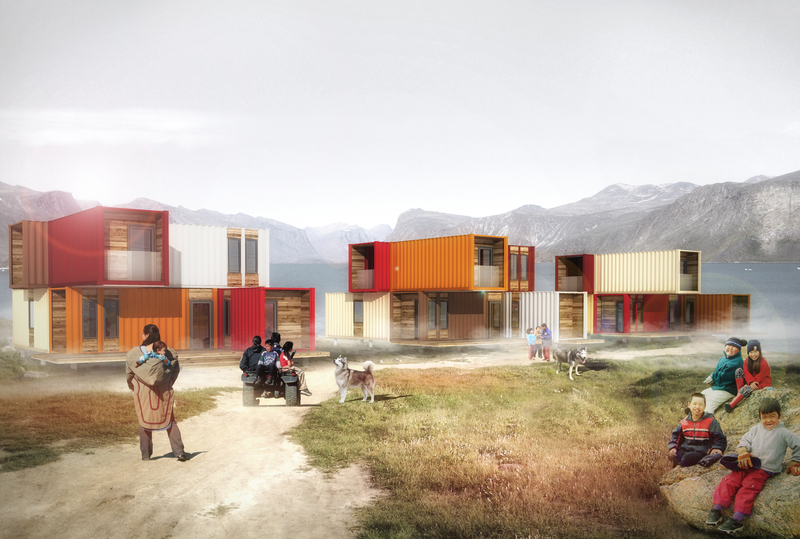 The structure of housing project is assembled with steel containers from deliveries by boat that the community receives. Rather than return empty containers by boat, these structures can be purchased and used to build the structure of these dwellings and avoid the extra costs of shipping other structural materials. Thus, cost savings and rapid mounting structure will be realized. Given that the period during which the nordics constructions can be run is very short, rapid installation by local labor will be a significant advantage in this kind of project. 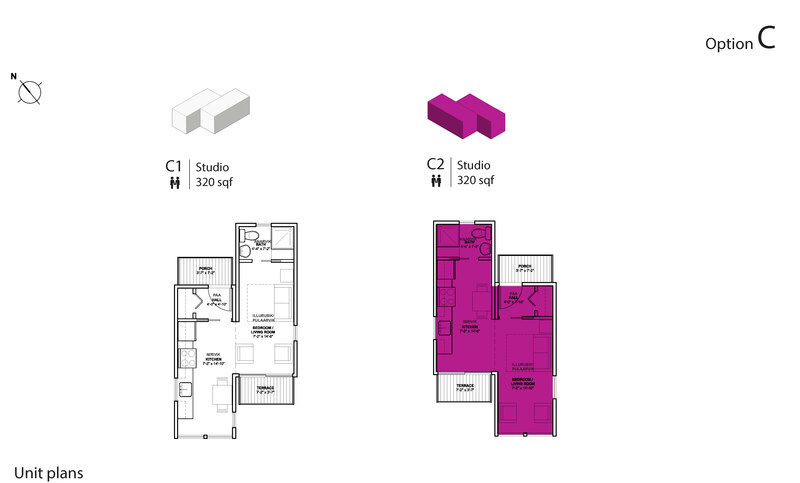 Containers of 8′ by 20′ are used in the options A, B and C. The majority of configurations are made with 2 or 4 twin containers to provide 1, 2 , 3 and 4 bedrooms to the dwelling. 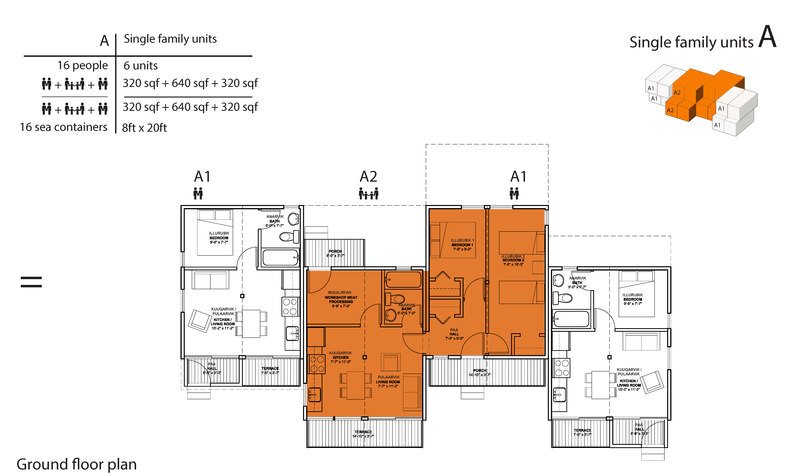 Single-family units (A1, A2, A3, A4) include a living room, dining room and open kitchen, many with a workshop and several rooms, with bathroom. 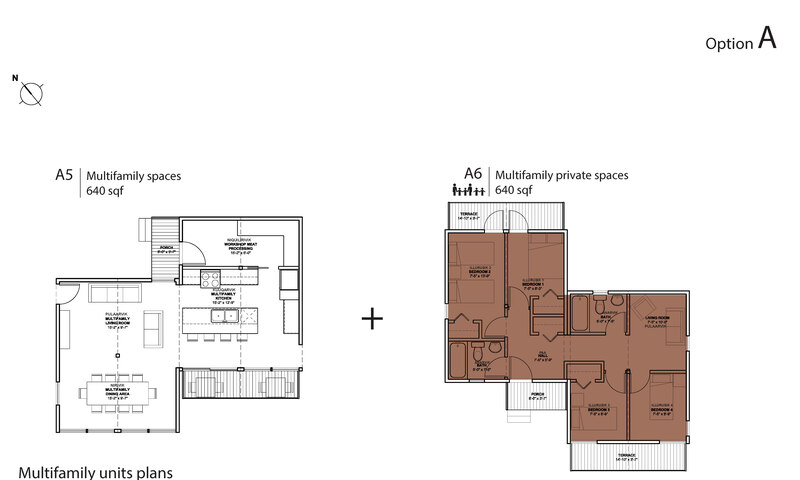 Multifamily units (A5, A6) include common living areas for several families, such as living room, kitchen, dining-room and workshop, as well as private spaces for each family, bedrooms, bathroom and small living room. 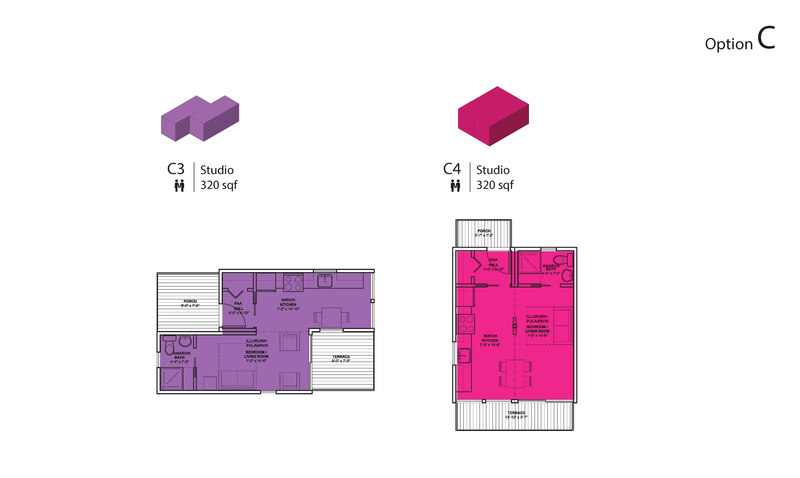 The studios (B1, B2, B3 and C1, C2, C3, C4) include combine kitchen and dining-room and a join living-room-bedroom with bathroom. All units include outdoor spaces (patios or balconies) allowing occupants to enjoy the sun and sit outside. 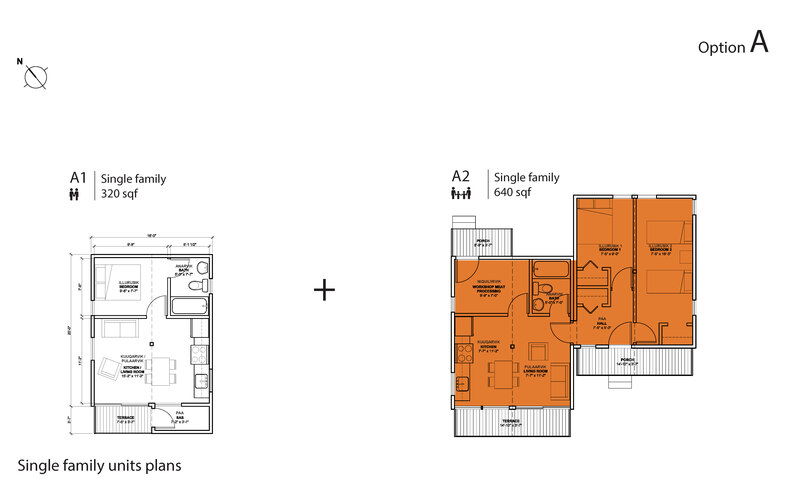 Combinations of dwelling units (A1 -C4) can be varied according to the needs and the families that occupy it. Many other combinations other than those presented in this document can also be realized. In order to meet the cultural needs of the occupants, a workshop for processing meat from hunting or fishing (seals, marine mammals, fish) is join to the kitchen. This space has a stainless steel countertop for preparing meat and included a storage space for equipment such as nets, spears, guns, ammunition and other. Additional storage space for boats, snowmobiles, ATVs and other equipment will also be made with containers. Skylights in the roof of the second storey will be installed to provide direct sunlight. This type of ceiling opening is traditionally found in many permanent and temporary structures, built by members of the community during the period of hunting and fishing on the land. The orientation of windows in northern climates is very important. That is why the larger openings will be located on the south side to maximize solar heat gain. 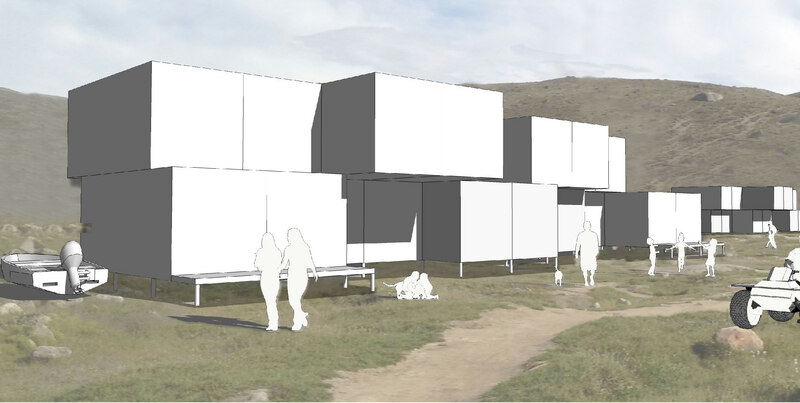 The containers configurations is design to group together several dwellings to save energy, reduce considerably heating costs and reduce pollution due to gas heating. A great insulation (R60) of the dwellings is essential and can be done from the inside and outside. Different techniques using; a sprayed insulation applied on steel walls or rigid panels insulation installed on the exterior walls could be design in further technical studies. Insulated containers for refrigerated shipping, could also be used in this type of construction. This project aims to develop local skills to encourage job creation, specialized training, access to ownership and self-sufficiency in the community. Carpenters, welders, electricians, plumbers, cabinet-makers and other trades, will participate in the construction of this project. The implementation of construction and dwelling cooperatives by the community and the new owners of dwellings could be a great way to reduce costs. These would act in the interest of the community and its members. Thus, the profits are reinvested in the housing projects, as opposed to hiring a foreign corporation with foreign interests would transfer the profits of the project only to its investors. Reuse containers for structure, the use of local labor, the creation of local cooperatives of construction and dwellings as well as the optimal insulation units will reduce the construction and exploitation costs. In medium and long term, the community will be able to develop other housing projects with the expertise and knowhow acquired during the first phase and will financed new projects with rents and surpluses. The containers will be anchored with steel piles driven into the permafrost to ensure stability, despite the freezing and thawing. This is the same technique that is used for new buildings in the community to avoid the effects of freezing and thawing, such as ground movements.